The ethical landscape of photojournalism is as contested as the terrain it depicts. Issues of agency, instrumentality, subjectivity, accuracy and voyeurism collide in debates about the practice of the photojournalist, the commissioning and circulation of their photographs, and the motivation of audiences looking at images of human suffering. Do war photographs encourage a closer look at the wider politics of the situations in which the images were made, arouse compassion and impel civil action? Are we so desensitized to imagery of violence that we primarily view the photographs with schadenfreude and bypass their socio-political dimension to praise the photographer for gaining such close proximity to the tragedy of others? This line of questioning becomes even more pressing when images made by photojournalists are shown to audiences in galleries and museums. For it is in these secondary contexts that aspects of authorship, style and connoisseurship might be leveraged above a nuanced consideration of the issues and events represented or the efficacy of the photographs in contributing toward social and political reform. 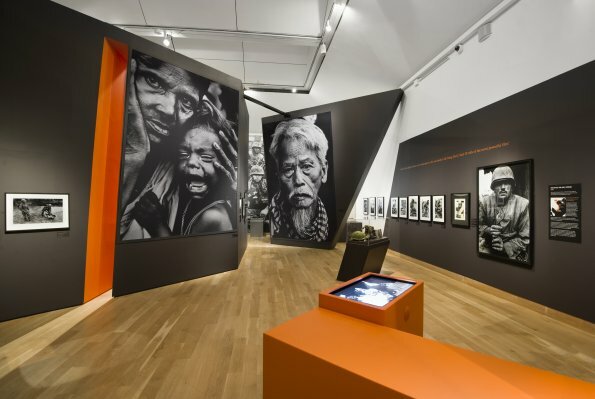 Shaped By War: Photographs by Don McCullin at Imperial War Museum London presents over 200 images spanning over 50 years of McCullin’s career on the frontlines of conflicts around the world. This exhibition maps a trajectory of Don McCullin’s career beginning with his first published photographs of disaffected youth in bomb-damaged London for The Observer in 1959, to assignments undertaken in the conflict zones of places such as Berlin, Cyprus, Vietnam, Northern Ireland, Lebanon and El Salvador, through to his recent still life and landscape work made near his home in the UK. Conventionally photojournalism is linked by captions to a news article about the individuals, issues or events portrayed. The image serves to persuade, humanize and illustrate a descriptive casinos in Missouri account, while the caption anchors the photograph within the narrative of a story. In lieu of the absence of the original news articles the photographs in this exhibition hang from a series of interpretive text panels featuring maps, information about the conflict or issue depicted, and quotes by the photographer about the particular assignment. However, this information is predominantly concerned with McCullin’s own experience of the conflict, his photographic style and his engagement with the particular commissioning organization. Details provided about the actual conflict or issue serve more as a broad descriptive backdrop against which McCullin photographed rather than a nuanced discussion and analysis of the socio-political forces that determined the events impacting on the lives of the individuals depicted. Divorced from their original informational context the photographs and their captions reduce the people, places and events in the images to generic descriptions. The effect of this deflects engagement from the wider social reality of the scene towards the bravery, working process and artistry of the photographer. This is further emphasized by information on the captions about the creation and provenance of the photographic prints, the display of a darkroom reference photograph replete with printing instructions, and the presentation of McCullin’s combat wear, press passes and camera equipment. Including one particular camera, which purportedly saved the photographer’s life by shielding him from a piece of shrapnel. A significant section in the exhibition is given to representing McCullin’s employment by The Sunday Times. The photographer’s process of working with the newspaper is outlined, from the commissioning, briefing and accreditation of an assignment, through to image selection, layout and publication of the final story. The illustration of this process gives some insight into the original context of the creation and use of the images, and provides an interesting account of the machinations of a bygone pre-digital era of newspaper production. Correspondence between McCullin and the editorial staff regarding a dispute over a decision not to publish his work from El Salvador, which culminated in McCullin’s resignation from the newspaper, is also included. The presentation of this material attests to the photographer’s belief in the instrumental purpose of his work in contributing to raising public awareness and influencing opinion. Wall-sized enlargements of the harrowed faces of impoverished people and touch-screen consoles charting the photographer’s travels punctuate the gallery space. The effect of the over-sized images reduces the individuals to archetypes of human suffering while the interactive technology elevates a sense of marvel at the breadth of the photographer’s intrepid career. An interview with McCullin in which he describes the events of his life and relays his beliefs and misgivings about photojournalism is screened in a darkened room. These curatorial tactics seem designed to heighten a sense of spectacle and amplify an emotive response by the viewer, underlining the conception of the exhibition to mythologize the biography of McCullin and historicize the trajectory of his career. The impulse of photojournalists to communicate stories about the experience of people caught up in conflict may be seen as an humanitarian act that seeks to contribute toward social and political change. However, it is a pursuit that is fraught with ethical and moral tensions in relation to the formulation, dissemination, contextualization and reception of the photographic representations created, as well as the strategization of a career. Very little can be learnt from a photograph of human suffering about the event depicted without mediation of pertinent information regarding the socio-political conditions in which the image was created. For when photojournalism is extracted from its original context, the rhetoric of a photograph can rarely be trusted to provide little more than an illustration of style and give testament to the proximity of the photographer to people whose lives truly are shaped by war.